So recently I’ve been watching a crapload of The Practice – you know, that turn of the century TV series that spun off into Boston Legal. Anyway, basically I’ve been watching through the seasons in order to get to the moment when the Alan Shore character appears, and the writers completely lose interest in their main characters and begin shutting the show down. 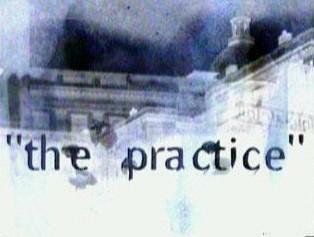 That isn’t particularly interesting or relevant, however one thing that I’ve become obsessed with is The Practice’s opening title sequence. Because it’s awful. When I first saw this sequence, I was immediately able to predict that the show was circa late ’90s, purely because its visual style reeks of being a bad copy of the incredibly awesome opening title sequence for Se7en – David Fincher’s dark and brilliant mid-nineties thriller. In fact, it’s not that hard to pick, because pretty much EVERY piece of motion graphic design for the years following Se7en’s release tried to emulate its uber-cool hand-made scratchy film jittery titles effects. It didn’t matter if you were producing a station ID for Network TEN in Australia, or if you were selling Nike Shoes, this was THE look you wanted to create. I can’t turn my nose up too high about this plagiarism though, as I was guilty of it myself for the opening titles of my first film school production ‘Inversion’. a fusion genre spearheaded by Teddy Riley and Bernard Belle which became extremely popular from the late-1980s into the mid-1990s. The fusion of hip hop with R&B doesn’t seem particularly novel or interesting now, but back then it was revolutionary, and set the future course for pop. One of the artists most associated with New Jack Swing is Michael Jackson, and particularly his Dangerous album. Which leads us back to The Practice opening titles, and in particular the bit just before the end. Which is quite cool, with its chromatically ascending bass line leading up to a synth stab (at 0:45) for the smash cut to ‘The Practice’ title. This synth is actually a little micro sample from Michael Jackson’s Smooth Criminal. A fitting reference. But the late MJ wasn’t beyond using microsamples himself. Here’s a track from HIStory, where he drops in a very brief grab from the opening milliseconds of C+C Music Factory’s “Gonna Make You Sweat (Everybody Dance Now)”. Now… what were we talking about again?